Complete Berry Markets Review 2019 | Is Berry Markets Scam or Safe? Hi everyone welcome to my Berry Markets review! 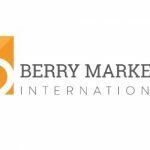 Berry Markets is a forex and CFD broker that offers two account types. The broker is also called as Berryfinex. The vision of the broker is explained by the superior customer service, by creating a global brand by ensuring that the profitability, success and happiness of its customers form the basis of their business. There is much information about this broker in this article. You can find in this Berry Markets review all the answers to the following questions: Is Berry Markets scam or good forex broker? What are the account types of the broker? What are the trading conditions such as spreads, leverage, and minimum deposit? Is Berry Markets regulated? The broker is incorporated under registered number 24852 IBC 2018 by the Registrar of International Business Companies, registered by Saint Vincent and the Grenadines. 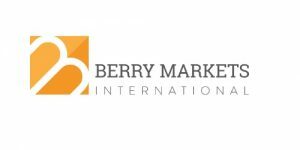 Berryfin International Limited, Berryfinex, BMI and Berry are trading names of TME group. As Berry Markets does not have a valid forex broker license, it is not entitled to trade in any regulated market such as the European Union, UK, USA, Japan, Australia. I always recommend you to avoid not licensed brokers and choose among the regulated ones. The most reliable regulators are the UK’s FCA, the Australian Securities and Investments Commission (ASIC) or the Cyprus Securities and Exchange Commission (CySEC). These regulators require a certain amount of capital from the brokers to guarantee the compensation of funds and a certain level of safety of clients’ money. The broker offers two account types. These are Swap Free account and ECN Account. Berry offers swap-free accounts (also known as Islamic Forex accounts or Shariah Forex accounts). These accounts comply with Islamic religious beliefs. According to the Islamic religion, any business transaction in which one of the parties has to pay or receive some interest from another party is forbidden. ECN which stands for Electronic Communication Network, is a network of Tier-1 Banks, Prime Brokers, and FCMs, connected together to form a deep pool of liquidity available for trading. The spreads on EUR/USD from 1.6 pips. Investment opportunity with account opening from as little as $500. The maximum leverage up to 1:300. Berry Markets provides its clients with excellent market trading conditions on major currencies and 50 pairs of instruments. You will have access to a diverse range of products including Foreign Exchange, Precious Metals, Future Contracts (OTC), Equity Indices (OTC), CFD’s and Energy Contracts. Berry offers different kinds of deposit methods. You can choose the most convenient for you from the list of multiple payment options. You can always fund your account using this most traditional money transfer method; it’s secure and cost-effective for large deposits. For convenience, they keep bank accounts with different banks and you may choose the most suitable bank for your deposits. There are also some e-wallet systems such as Skrill, Neteller, and Jeton. Unfortunately, there is no information about fees and withdrawal limits. 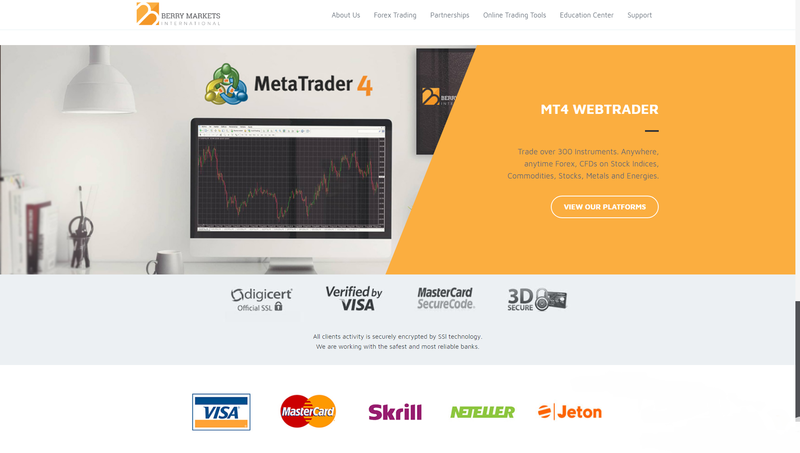 Berry Markets is an offshore forex broker that offers MetaTrader 4 with limited trading products. The main issue about the broker is its regulation. Your funds may under risk if you want to trade with them. I recommend that regulation is crucial for the safety of any investment and only well-respected financial institutions like the UK’s Financial Conduct Authority (FCA) or the Australian Securities and Investments Commission (ASIC) can provide sufficient security to investors. If you want to trade with a well-regulated forex broker, you can check my top forex brokers list on the top of the page. See you next time!